This week on The Clone Wars: Ahsoka is on the run some more in "To Catch a Jedi." Unlike many episodes of the series, this one is actually really exciting, giving us a chance to look at the lower levels of Coruscant (and we get so close to level 1313) as we get glimpses into just who (probably) really did set up the Jedi temple bombing a couple of weeks ago. While we don't meet many new characters, old familiar faces are back and will continue to make you mad that Hasbro isn't making more toys of these designs. Spoilers and video after the break. Aping the action and music of the original Star Wars once more, this episode was a finely-crafted specimen. Ahsoka continues her star turn as basically the center of the entire season, helming both some of the best and worst episodes of the year. This is one of the best, and there aren't too many new character models on display... although I am willing to bet the sets were expensive. One of the most fascinating parts of Star Wars are the criminal underworld, the reaches in which alien life forms survive in, frankly, bad neighborhoods. The worst, really. Why we haven't spent more time in this parts of the galaxy is beyond me, I always find it to be a huge treat whenever we see the Hutts or the bowels of the Republic's crown jewel. The plot: Well, the title gives it away. 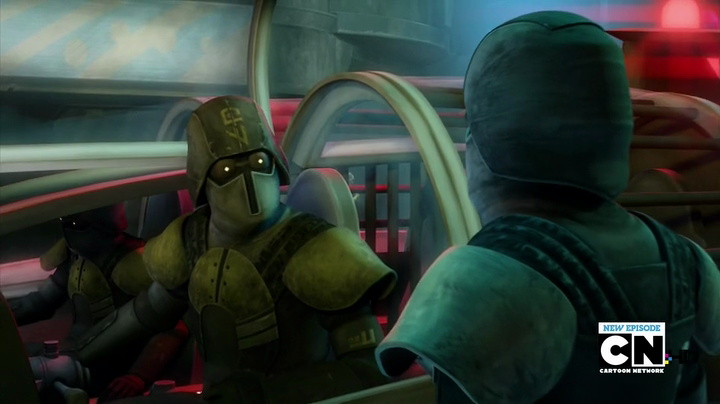 Anakin and Plo Koon are dispatched by the Jedi Council to bring in Ahsoka for questioning/trial/public floggings, so this is another chase episode. Ahsoka attempts to disguise herself with a cloak on the lower levels of the planet, which would probably be effective if she didn't land directly in front a bunch of police officers. She can't catch a break, but she does briefly team up with Asajj Ventress for what may be the greatest single Clone Trooper beat-down since Yoda and Obi-Wan Kenobi sliced and diced their way through the 501st Legion in Revenge of the Sith. 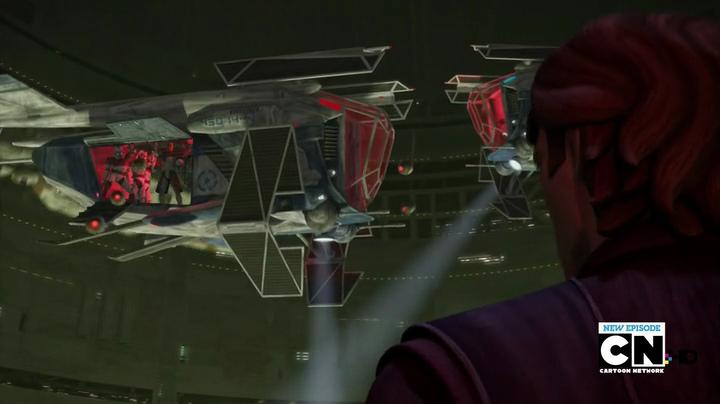 The one big new thing that you just can't miss is a sort of a Gunship/TIE Fighter hybrid, two of which are dispatched by the Jedi and look a little funky. They seem a little over-designed in the same sense of some vehicles from the 1990s video games and Expanded Universe in general... the elegant simplicity of the other craft was left behind in favor of beating you over the head with a "The Republic Is Turning Into The Empire" aesthetic. We also got to see some probes being dispatched and they were pretty simple. Flying olives, really. Ahsoka seemingly has a friend with the Jedi, although that's up for debate as we watch Barriss Offee throughout the episode. Ahsoka contacts her on what appears to be a pay phone, and Ms. Offee gives her "clues" which ultimately lead into her capture by the Jedi. 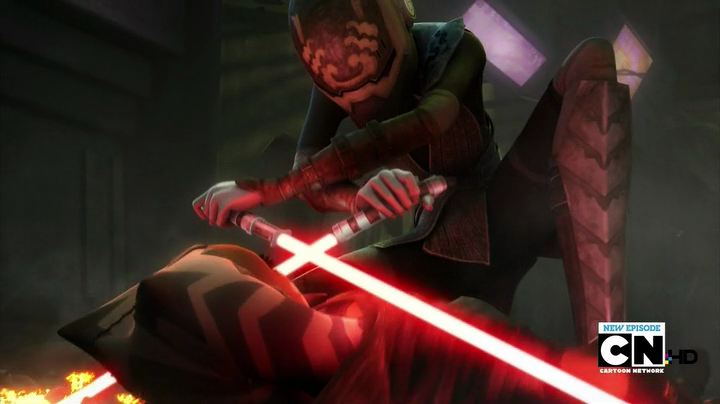 There's a pretty nifty intense fight between "Asajj Ventress" and Ahsoka, after Asajj gets her mask stolen, which would probably be more dramatic if they didn't tip their hat regarding just who was in the mask until after the fight. The fake Ventress' quick moves are sort of a dead giveaway as well. The episode's moral is a bit of a red herring, which tips the audience to betrayal but not necessarily by the person you might have expected. We had some really fantastic music this week, although maybe we didn't. I remember hearing that the best sign of a good soundtrack is if you don't notice it, and this one reeked of John Williams and the original trilogy - it was really good, and it fit the mood of the show quite nicely. This was a great episodes all by itself, although seeing just how much exposition they can cram into the opening 20 seconds shows how the writers may be chafing under the weekly format. This arc might have been a better "movie," but we'll know for sure next week as we watch a trial, because if there's one thing I need more of in my action-adventure show for kids it's due process and senate arguments. Asajj Ventress may be the best-developed character in the entire series, it's a crying shame she doesn't get more screen time this season. Or more plastic. The Jedi Council sure are untrustworthy old grouches, aren't they? I expect this era will be the "good old days" for a lot of fans, sort of like how I held fast to the TV projects of the 1980s. The key difference is that The Clone Wars had better ideas for toys, making this sort of a botched 22-minute toy commercial.